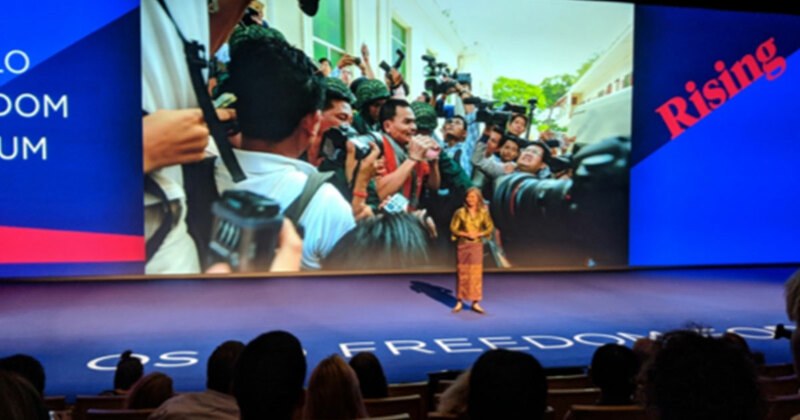 On the second day of the conference, between the last presentation and the dinner, Claire and I travelled to the Nobel Peace Prize Center in the middle of Oslo. As we entered the center of the museum, chairs were set up and sitting in the front were Yeonmi Park, a North Korean defector ready to share her story, and Marina Nemat, an Iranian author that had been imprisoned in Iran at a very young age. They spoke, sharing stories that were truly unbelievable in the purest meaning of the word; hard to believe. Yeonmi told the people in the room about her struggles getting out of her country, her troubles in travelling through China, being sold as a slave and being smuggled across the border. She also told us about her trip to Mongolia and bargaining for her life with the Mongolian military. Marina told us about adjusting back to her life after being released from prison, the guilt she felt from being the only survivor out of all her friends, and the pain she had, both mentally and physically, from the torture she endured. Both women knew what it was like to fear for their lives. A woman stood up during Q&A and asked Marina where she was going next and what we as an audience could do to help her with her endeavors. She ignored the first part because she believed what she was going to do next was not as important as what we were going to do as future and current human rights activists. There are so many important quotes and anecdotes that you get to hear being in attendance at the OFF, but this one was perhaps the most significant for me. I went back to my room that night and thought about my country. I thought about all the things that were going wrong and how little people were doing to solve them. I realized that I wanted to help, and I will. I don’t think the speakers at the OFF realize how much of what they say matters in terms of shaping the views of the young people in the audience. Some of the words that we get to hear are so impactful. I know for a fact that I will remember some of the things said for the rest of my life and will remind myself of them in my times of need. Every chance I could outside of the panels, I approached the different speakers and thanked them for their time. I tried to make them understand that what they said had mattered a lot. The OFF matters for young people looking for direction in their life, and even if the speakers don’t realize it, what they say can define what young people do with their futures.